Sterling Publishing (NY), 9781402785542, 157pp. 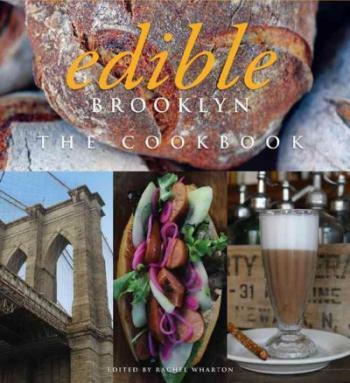 Brooklyn, New York, is a down-to-earth, unsnobby feast for foodies--and Edible Brooklyn Cookbook captures that same fun vibe. It features unpretentious recipes from local artisans, chefs, and ordinary folk who celebrate Brooklyn's finest ingredients. And, like the borough's eclectic population--which includes Italian, Asian, Polish, Mexican, Russian, you name it--you never know what you'll find when you turn the page. After all, when was the last time you saw a cookbook with chapters for small plates and snacks and sandwiches, vegetables, pickles, and sides? Part travel guide, part recipe collection, part great read, this volume is the first in a series of four Edible cookbooks--and it offers a deliciously up close and personal view of one of American's most exciting food fests. Edible Communities, Inc. is a publishing and information services company that creates editorially rich, community-based, local-foods publications in distinct culinary regions throughout the United States, Canada, and Europe. Through their publications, supporting websites, and events, they connect consumers with family farmers, growers, chefs, and food artisans of all kinds. Rachel Wharton has lived in Brooklyn for 11 years and is the deputy editor of both Edible Brooklyn and Edible Manhattan. She holds a master's degree in Food Studies from New York University, and she won a 2010 James Beard Foundation journalism award for her columns on iconic restaurants in Edible Brooklyn, while her profile of Russ & Daughters in Edible Manhattan was included in the book 2010 Best Food Writing.